is a board-certified dermatologist who can treat a variety of skin, hair and nail conditions. Utilizing medical knowledge, and with a professional team of skin care medical assistants and aestheticians, Dr. Niroomand strives to provide the best treatment available. 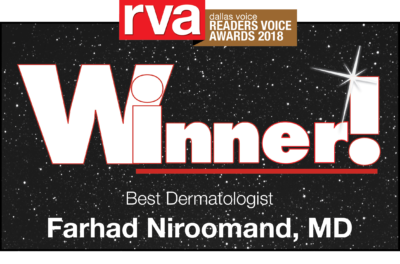 Dr. Farhad Niroomand and his medical staff bring you quality skin care with exceptional customer service. We believe in developing relationships with our patients. It is our goal to provide you with the care and services that you can trust and depend upon as your needs evolve. Dr. Niroomand believes dermatologists are best suited to take care of your skin issues. Enhance your appearance to reveal a younger, healthier look with cosmetic procedures that will help you achieve your goals. Whether you are considering microdermabrasion, laser hair reduction, laser skin rejuvenation and resurfacing, Botox® and Dysport®, or other treatment options, Dr. Niroomand and our skin specialists are here to guide you. We offer a complete range of dermatology and cosmetic services that help reveal your beautiful skin. Dr. Niroomand and his professional staff will work with you individually to achieve the results you expect. Get answers to all your questions about who we are, what we treat, our aesthetic procedures, and billing & insurance. Our online payment portal is a safe, convenient, environmentally friendly, and an inexpensive way for you to make payments. The information on this website is for educational purposes only. It is not intended to be a substitute for professional medical advice, diagnosis or treatment.